Tonight NASCAR inducted its newest class of Hall of Fame members. Welcome the newest members of the HOF…Buck Baker, Cotton Owens, Herb Thomas, Rusty Wallace and Leonard Wood. All of these newest members made an impact on the sport of NASCAR. For those who don’t know the NASCAR Hall of Fame is the newest sports Hall of Fame to be in existence. The first class was inducted in 2010. I remember the debate that waged on about who would be in the first class. Of course the first names that came to mind for me was Richard Petty and Dale Earnhardt. How can you NOT put those two men in the first class. Both are seven time champions and still have an enduring impact on the sport today. Of course the other person that came to mind as well was Mr. Bill France Sr. There would not NASCAR without him. I had no argument with Bill France Jr. and Junior Johnson. The 2011 & 2012 class were also filled with men who made an impact on the sport as well. NASCAR when compared to other major sports in the United States is still very young. NASCAR has only been around since 1948. But that doesn’t mean men and yes, women weren’t racing. Since cars rolled off the assembly line men and women have tried to see who had the fastest car. This has not changed. I still would like to see some more of the pioneers be inducted before they start inducting more recent NASCAR drivers, owners, etc. It’s important for us who haven’t been following NASCAR all those years understand how the sport got started. Congratulations to the newest members of the Hall of Fame! Speaking of history…Darrell Wallace Jr. will become the fourth African American to get a full-time ride in a top series in NASCAR. It will be announced on Saturday, Darrell will drive for Kyle Busch Motorsports in the Camping World Truck Series. He will follow in the footsteps of Wendell Scott, Willie T. Ribbs, and Bill Lester. I have to admire Wendell Scott. He drove in NASCAR from 1961-1971. I cannot even begin to understand what it must have been like for Wendell Scott. Wendell Scott is the only black driver to win a race in a national series back in 1964. I am hoping he will be inducted into the HOF within the next couple of years. He may not have the number of wins or championships like some other drivers, but he certainly deserves to be in the Hall of Fame. To me the HOF should be about pioneers and those who made an impact on the sport. To me Wendell Scott did just that. Think about what America was like during the time he raced in NASCAR. I am sure it wasn’t easy for a black man to compete in a sport whose roots were in the South. I really don’t want to get into a debate about how NASCAR should be more diverse that’s not what this paragraph is about. We can save that discussion for another day. NASCAR announced this week for those drivers who finish in the spots 39th-43rd will receive $4,000 less for each position. Basically the other money will be redistributed to the other spots in the field. This announcement will affect those who start and park the most. I have never been a big fan of the start and park drivers, but I understand why some teams have to do this. Competing in NASCAR is not cheap. You can’t just run down to the local Wal-Mart and buy tires or run to Autozone to get the necessary parts for the cars. Teams have to pay drivers, crew, engineers, etc as well as transportation costs along with many other incidentals that we as race fans never see on a daily basis. Sponsorships are few and far between these days. There are major race teams who have difficulty finding sponsorships. I can’t even imagine what it is like for these smaller teams. This will definitely have the start and park teams deciding on which races they will run this year. If it was me, I would look at those that would give me the most bang for my buck. One more note…because I am a DISH Satellite customer, I cannot watch my local Fox channel. There is some disagreement between DISH and the owner of the local Fox station about some kind of price increase. Until they come to an agreement, I am blacked out from all my shows. This means if they DO NOT come to some kind of agreement, I will NOT be able to watch the Sprint Unlimited next weekend. Of course this means that one of my friends will have me for a house guest next weekend! If I am unable to watch next weekend, I will be ok, but if I have to miss the Daytona 500, I WILL NOT BE A HAPPY NASCAR FAN! So if you are listening DISH and my local Fox affiliate, come to the table and get a deal done. I am sure I am not the only NASCAR out there who is unhappy about this situation! Now for a little bit of fun stuff…I bought two race magazines to get ready for the 2013 season. I was lucky enough to find a NASCAR Illustrated with Tony Stewart on the cover at my local Wal-Mart. But what made me smile the most was my youngest son Chase. He saw one of my magazines sitting on the couch and asked if he could read my racing magazine last night. He is only four years old and he loves Tony Stewart! Every time he watches a race with me he is always looking for Tony’s car. So when he was reading the magazine I had to snap this picture. And this morning he asked me if he could read “The Tony Stewart Magazine”. Man…his indocturination is complete. This boy is now part of the NASCAR Nation! 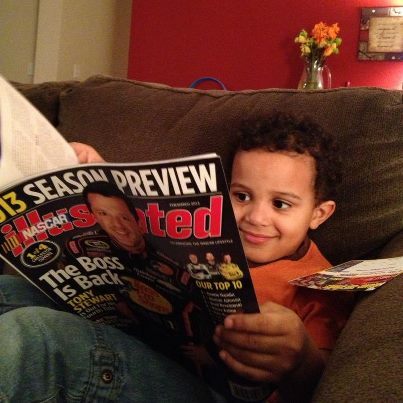 Great post about the HOF class of the year….but I LOVE that picture of your son and the NASCAR Illustrated!! NASCAR really is a family sport!